example_of_macro_v100.txt Nov 2016 is the first iteration whic expects thin bright structures against a dark flat background. measure_width_macros_v101.txt 22 Feb 2017 adds fft highpass larger than the structures to flatten the background and other contrast adjustments. This macro is for measuring the width of a bright linear structure such as the connection between two cells, a blood vessel, or an aerial view of a road. 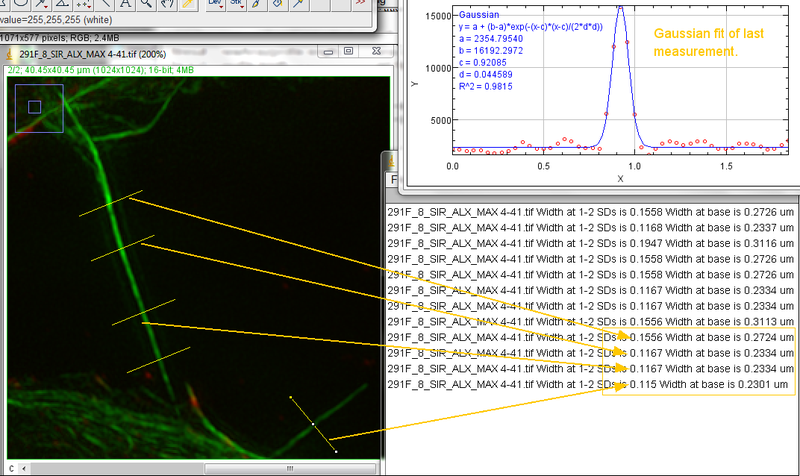 The macro gets a line profile plot and fits to a the simple Gaussian function coded in ImageJ. For this to work, there needs to be sufficient uninterrupted background values. The second version ofthe macro flattens the background using fft filtering. It also inverts the image because these images are inverted from the original application coded. The next version will measure the width of a structure in one channel and then the overlapping structure in another channel so they may be compared, kind of like a G ratio. There are example images, but the biology in them needs to be published before we can post them to this webpage or we need to make replacement examples.